Thank you for your interest in our Premium directory listing option. Below you'll find a chart showing the additional benefits of a Premium listing vs a Basic listing in our pole dancing directory. And just below that, you'll find a bit more information about the benefits of each add-on. As you can see, a Premium listing allows you to place additional photos, video and even a map on your page (don't worry, we take care of generating the map for you). This creates a much more visually appealing page, which not only increases the time visitors will spend on your page, but also builds trust in your business. In addition, you may choose to supply us with a coupon (jpf or gif format please, max width 500 px) with any promotion you choose. For example, offer 2 for 1 on a beginner class session, or 20% off a single enrollment, or $25 off a course fee...it's your coupon, so you can offer whatever you'd like. And you can change it whenever you like, at no additional charge! Offering a coupon is a great way to track engagement with your listing. If visitors are downloading your coupon and bringing it in to redeem it, you'll know they're seeing your listing. Another fabulous feature of a Premium listing is the secure email contact form. In order to keep your business email address safe from spammers, and to provide you with another way to track engagement with your listing, your Premium upgrade includes a secure contact form. This is a short form that visitors fill out to request more information on your classes, parties, or your studio in general. Your email address is not visible on the form, which keeps it safe from spammy email harvesting programs. The contact form collects the name and email address of the person inquiring, and automatically passes their contact info and questions directly to your email address via our secure server. They are YOUR potential customer, so we pass their info directly to YOU, allowing you to respond to them immediately. We will never contact your leads, promise! Of course, we also remove all 3rd party ads from your Premium listing page. This focuses visitor attention solely on your business and what you have to offer. With no ads to distract them, visitors are more likely to take YOUR desired action. And we also go one step further by providing custom formatting, professional editing, and optimization of your content to ensure your Premium listing gets picked up by the major search engines quickly, and is visible to your potential customers. 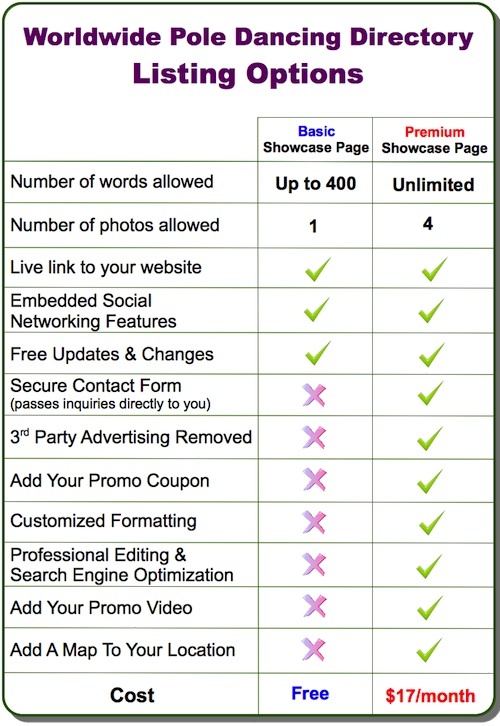 We want your Premium listing showing on the first page of search results for relevant search terms in Google, Yahoo! and Bing. This makes it very likely that people who are looking for pole dancing in your city will find YOU, instead of your competition. The cost for all these features is just $17 per month. When you compare this to the cost of offline advertising and its limitations, I'm sure you'll agree that a Premium listing is a real bargain. Newspaper, magazine and radio advertising are prohibitively expensive for most small studios, and the exposure they give to your business is limited to the length of time the ad runs. Placing an ad in the Yellow Pages will give you year-long exposure, but the bill for a tiny 3 line ad will run you at least $150 a month. Compare that to an illustrated, interactive, full page informational "brochure" on our highly trafficked website at just $17 a month. Plus, unlike the Yellow Pages, there's no contract so you're not locked in. If you ever want to cancel, just let me know at least 5 days before the end of your billing cycle and I'll cancel your Premium listing, no questions asked. Ready To Start Your Premium Listing? To start your Premium listing, simply use the form on this page to contact me. Just let me know you'd like a Premium listing and I'll send you an email with all the information I need from you. Just reply to that email, inserting the requested information. Using the images and other information you send me, I'll build a draft Showcase page for your review, and I'll revise it until you're 100% happy with it. Once you approve your Premium listing page, all that's left is for you to make your first payment and your listing will go live that same day. Easy!